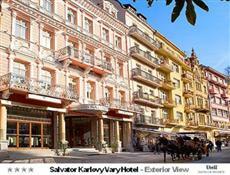 The Salvator Hotel Karlovy Vary is located proximate to the Mill Colonnade, one of the city's main attractions. Within this area guests will find that there is plenty to do including exploring the local shops, viewing the museums and attending the live music performances which are frequently held in this area. From the Salvator Hotel Karlovy Vary, it is approximately 60 miles to the international airport in Prague. The rooms at the Salvator Hotel Karlovy Vary carry a four-star rating. Each of the rooms is provided with wireless Internet connectivity courtesy of the hotel. The hotel rooms are also equipped with work desks, televisions, a minibar and safes. The private baths come with bathrobes and slippers provided by the hotel. The Salvator Hotel Karlovy Vary contains a host of amenities onsite. Guests may enjoy their meals right on the premises at the hotel's restaurant. The hotel also has a cocktail club and bar available for guest use. Those guests who arrive by private car will find that there is parking available.